Nothing pairs better with grilled cheese than tomatoes, but the recipe below offers a unique spin on the classic soup-and-sandwich combo. Instead of puréeing tomatoes into a smooth soup, this recipe calls for roasting them until they're sweet and caramelized. 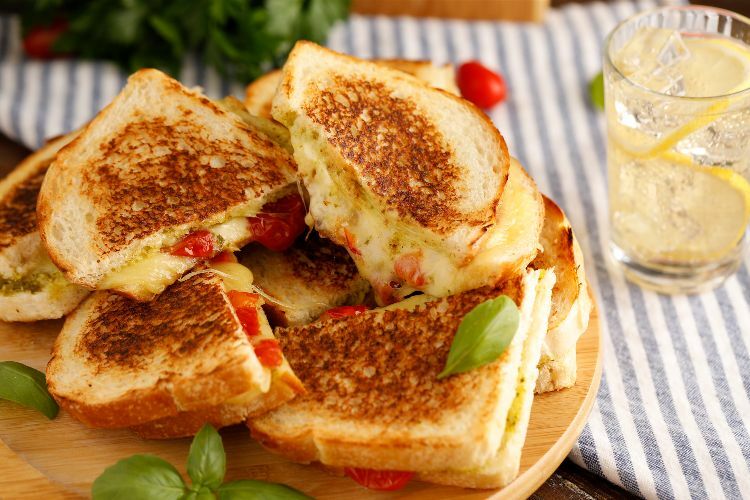 After that, they're layered on thickly sliced sourdough with fresh mozzarella and pesto to make a savory sandwich with an Italian flair. It's important to roast the tomatoes until most of the moisture has evaporated; otherwise, they'll make the sandwiches soggy. For this reason, choose fleshier tomatoes like Roma or beefsteak. 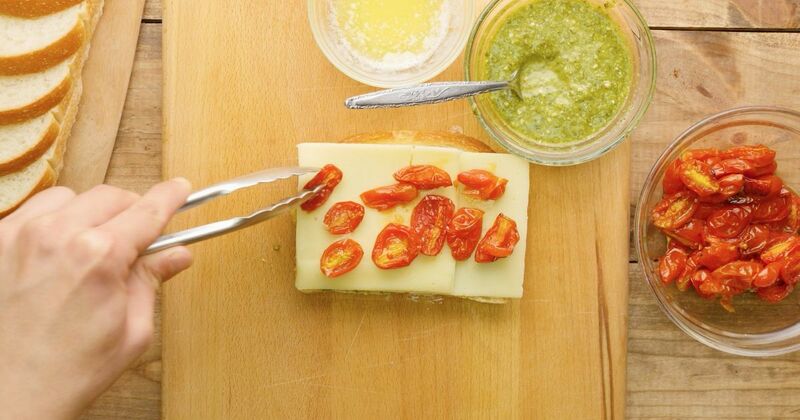 You could even make this sandwich with heirloom cherry tomatoes for even more sweetness. Preheat the oven to 400 degrees Fahrenheit. Toss the tomatoes with the oil and the salt, then roast for about 30 minutes until golden brown. Set aside. Spread the butter over both sides of the sourdough slices. Spread the pesto over half of the slices, and top with the mozzarella, followed by the tomatoes. Close the sandwiches. Working in batches if needed, cook the sandwiches in a nonstick pan over medium heat, pressing down with a spatula to ensure they cook through. Cook about 4 minutes per side, or until golden brown. Top with the basil and serve.